Last week Philip Sheppard supported Toumani and Sidiki Diabaté in Norwich with a superb set for electric cello that engaged the packed non-classical audience from the first notes*. Afterwards, I complimented Philip, who is a Fellow of the Royal Academy of Music and an in demand film composer, on the compelling headphone-like sound in the auditorium. To which he responded with the telling observation that 'No one mixes for speakers these days'. Today the mix of choice in recording sessions is the immersive up close and personal headphone sound, and not the traditional speaker mix portraying the musicians spread out at a distance in front of the listener. Classical music needs to take this on board if it really wants to reach a wider and younger audience. Because the sound in a classical concert is balanced to the same conventions as the traditional but redundant studio speaker mix. There is an erroneous and dangerous orthodoxy that the sound of classical music is encapsulated in the score and is, therefore, sacrosanct. In fact, as explained in an earlier post, the sound is defined by the complex interaction of seven attributes, pitch, rhythm, tone colour, absolute loudness, relative loudness, spatial location and acoustic. The composer's score only defines pitch, rhythm, tone colour and relative loudness (dynamics). This leaves absolute loudness, spatial location and ambience as non-composer defined variables, and these have been defined and fixed for more than a century by convention. As my earlier post noted, headphones are now the norm for listening to music**, with immersive 5.1 surround sound systems as the alternative. Adjusting the non-notated variables of absolute loudness, spatial location and ambience, both in recordings and in the concert hall, would make the music more up close and personal, thereby bridging the crucial sonic gap between classical music and new audiences. I have argued many time here against the dumbing down of classical music, and I am aware that changing the sound could be interpreted as dumbing down by another name. So let me explain why that interpretation is wrong. In a comment on my post New audiences want classical music up front and personal composer and violist Elaine Fine wrote: "If all recordings could be made from my seat on the second viola stand in the orchestra where ... I am playing Beethoven's Seventh this week ... everyone ... would understand the way music is put together". Elaine is saying that the 'right' sound for her is that heard from her seat in the orchestra. For the conductor, who is ultimately responsible for the sound balance, the 'right' sound is different: it is the sound heard from the podium where the maestro is within touching distance of front desk musicians. Yet, convention dictates that the 'right' sound' for the audience, both for concerts and recordings, is different yet again: it is as heard from several rows back in the stalls - the traditional speaker mix. Which, again, is dramatically different from what a first-time concertgoer hears in a cheap seat. For instance, at the BBC Proms, the cheapest seats in the Royal Albert Hall are more than 200 feet from the orchestra. At that distance the sound is dramatically different from that heard by the conductor, and it is also dramatically different from what the first-time concertgoer will have been conditioned to by headphones. Across the Thames is the Royal Festival Hall, and a reader described how from the rear stalls of the 2500 seater hall the orchestra can be heard "playing in the distance like a phantom radio programme on the BBC World Service long wave". Which, again, is a stark contrast to the new concertgoer's headphone reference sound. But let's return to what you hear from a good seat in the stalls. It may, by convention, be 'right'. But, it is not true. The true sound of an orchestra is the noise made by the instruments before any reverberation is added by the hall in which they are being played. So, in fact, the 'true' sound of an orchestra is that heard in the acoustically dead space of an anechoic chamber, or in the open air. But sound totally devoid of reverberation is very unpleasant for both the audience and the players; which is why in the 18th century the concert hall as we know it today began to evolve. Today there are many fine concert halls; but they are tied to conventions established by the generation of iconic halls that were built in the last decades of the 19th century; these include the Concertguebouw in Amsterdam and the Musikverein in Vienna. These halls, together with more modern auditiria such as Snape Maltings, are quite rightly acclaimed for their acoustics. However, the acclaimed sound you hear in them is not the true sound of an orchestra: it is the result of a subjective 'ideal reverberation time of around 1.8 seconds created artificially by acoustic experts using the arcane technology of sound reflecting building materials. And that is the point of this post: human behaviour and acoustic technology have changed considerably since the late 19th century, yet the sonic conventions of the concert hall have remained virtually unchanged since then. I think what the future must bring is things which are considered blasphemous, like amplifying classical music [...] It is a kind of compromise that I think will have to happen, and if it happens, I think young people will really realize what they’re missing. They’ll realize that they’ve been stupid to be so sort of afraid of the concert hall and its demands. So that’s one vision of the future; I think nobody should be deprived of classical music, least of all by rather silly conventions, which we all tend to think are sacred***. * Part of Philip Sheppard's Norwich set can be heard on SoundCloud. ** It is worth noting that some classical producers have used headphones in the control room for many years. I noted in a 2010 post that tonmeister Jens Brauns used Stax headphones to monitor an acclaimed BIS recording of Pehr Henrik Nordgren's music. Above is photo from a recent Neu Records recording session. More on their innovative approach of offering alternative surround mixes in Britten looking forward. 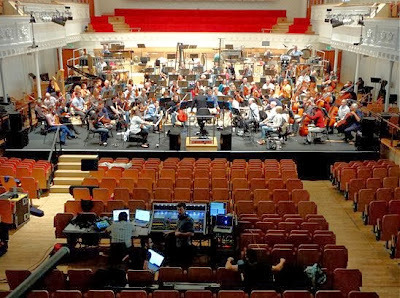 *** Header photo shows the venerable Usher Hall in Edinburgh being converted to a virtual concert hall for a performance of Jonathan Harvey's Speakings with the BBC Scottish Symphony Orchestra conducted by Ilan Volkov. Speakings, which is scored for large orchestra and electronics, uses pre-recorded spoken sequences that are digitally modified by IRCAM created software and syncronised with the orchestral sound in real time and broadcast around the auditorium through an eight channel surround sound system. In an earlier post I described how on the CD, which was engineered by the BBC in Glasgow City Halls and released on the French Aeon label, Jonathan Harvey controls the spatial element, and listening to it on headphones produces a frisson that is absent with speakers. Any copyrighted material is included as "fair use", for the purpose of critical analysis only, and will be removed at the request of copyright owner(s). Also on Facebook and Twitter. Absolutely brilliant article, thank you! Moving with technology is certainly not 'dumbing down' classical music - it just adds a further dimension of sound, making it even more detailed and interesting. Being generous, I’d say that audiences arranged around a concert space intuitively adjust expectations of the proper sound (a nebulous concept) the same way one uses white balance to automatically adjust for changing lighting conditions as the sun transits across the sky. 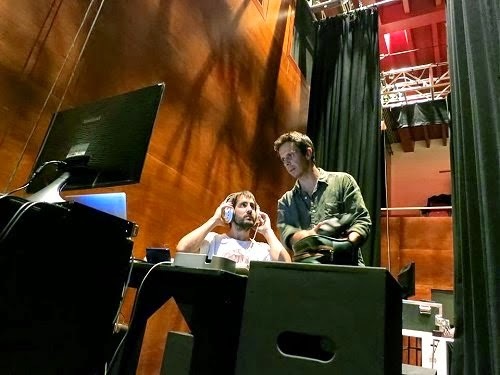 With amplified music in a concert or dance venue or with recorded music in a home or over headphone (or in earbuds), the listener has no option but to adopt the perspective mixed by the sound board operator and recording engineers. I agree that up close and personal is preferable to being at a considerable distance. Gallery seating behind the orchestra is very popular despite its inherent degradation. Either way, I can tell when a performance has intensity and integrity vs. when it lacks. I prefer audience perspective in recordings over podium perspective; the latter’s constant fiddling and fussiness with spotlight mics often makes the sound unnatural. Certainly, there’s been a lot of experimenting and no one size fits all. Another terrific post. As I've said before - your audio posts are wonderfully helpful. A while back Phil Ford on his Dial M for Musicology blog talked about music being a "technology of experience", which I really like because it puts the experience of the audience front and center. I'm in full agreement with you that whatever can be done to maximize that experience in this modern day and age is the way to go. I find it amazing that with all the talk about keeping classical music alive, as far as I know, you're the only one delving into this aspect of it all. And while I'm here, let me suggest a new blog on the neuroscience of music (another aspect of the technology of experience) that's doing a great job covering how our brains process music. Lois Svard (a friend of Kyle Gann's) is not the only one doing this, but for my money she's doing by far the best job. This link is to a post on the visual aspect of listening. One of the first Proms I attended was a performance of Mahler 8. I had a ticket in the gods and was struck by the vertical aspect of the music as it passed between SAT and B—the Albert Hall choir stalls are very steep.